First chance I had out(10/2) and only seen 2 does. On the way back through the timber noticed a flock of turkeys feeding my way. Long story short, was wearing my homemade gille and they got close enough for me to arrow this young tasty bird at 7 yards. Least I know the suit works! Nice goin Roger! Great shooting! Only half dozen turkeys with a bow!! Heck that make ya an old pro Dude!! Congrats! 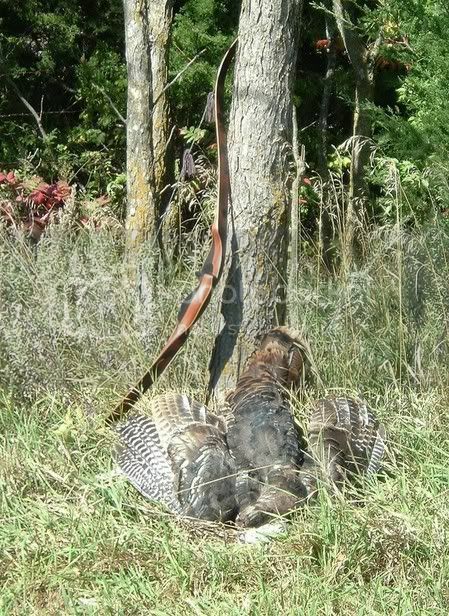 Way to go Roger.....Since you've taken a half dozen more turkeys with the bow than I have, I qualify you as an expert.....Where do you like to hit'em with an arrow? Wally, Haven't got the best answer for that. I've had 2 fly over 75 yards after a complete pass-through and another with an arrow stuck in him. I've used adders behind my broadheads and they really to a number on the insides of those turkeys but they're really tuff birds. I've had the best luck with avoiding a side shot and just putting an arrow straight on from the back or front to break the back and running gear down. As I said I'm still learning and drawing on those birds isn't always easy. They move alot and there's always a bunch of eyes looking at everything than moves. By the way, shot my first one years ago from a popup blind. Will never do that again. I lost so much of the enjoyment by being locked up in a tiny black spot looking out a hole. Reminds me now of so many of the hunting shows shooting from a fiberglass treehouse over a baited field at fenced deer. Sorry I rambled on, it's the old man in me!